Today, I went to Sam Ash for shopping. I was looking for amp for my Sanshin play and really love the store. Hi, I have opened music and dance classes on Saturdays. In the dance class, you can take court dance or folk dance lessons or both. and other instruments of Okinawan traditional music. Please contact me @ Junko@junkofisher.com to reserve your space! Here is today's Ryukyu Shimpo article regarding my recital which was held on June 23 in New York City. I received some photos from Okinawa. The photos were taken by Mr. Kenji Oyama at the Nippon Club opening reception for the Okinawan Arts in New York held on June 20 at the Nippon Club banquet room. Mr. Kenji Oyama's original arts are currently presented at the gallery of the Nippon Club. Kieko Higa, Hitoshi Kikukawa and I performed at the reception. Mrs. Miyuki Oyama also performed piano. I participated in a Tanabata (Star Festival in July seven) & Bon Odori Festival yesterday. 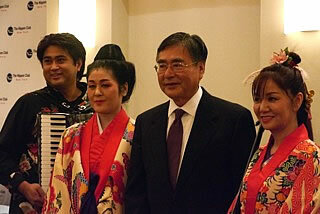 The event was hosted by the Japan Societyof Fairfield County of Connecticut. I always enjoy this festival. Yesterday, one of my students who lives in CT joined and a lady who originally comes from Okinawa and lives in that neighborhood also joined. It was full of joy and surprise. A few showers dropped during Hanagasa Ondo odori, but the rain stopped quickly. We were invited by the Association for dinner (Japanese restaurant) after the event. Hi, my name is listed in a column of the Dance section of today's New York Times. Mr. Wally was one-time private student of mine in May. He has mastered two Ryukyuan dances. Mr. Wally will have his demonstration at LMCC next weekend. Please join them. Loot." In "The Set Up: Junko Fisher,"
The Set Up: Junko Fisher begins with an invitation to Junko Fisher, Traditional Ryukyu (Okinawan) Dancer and Folk Singer, to teach an existent form. This direct experience initiates other stages of The Set Up, including indirect experiences, a response and a final stage of reflection ending in performance. The process is designed to mine the layering of superficiality and depth inherent in the assumption of the universality of dance. Additional support for this project was provided in part by funds from the New York State Council on the Arts and the Mertz Gilmore Foundation, and the Doris Duke Charitable Foundation as part of LMCC’s sustainable practice initiative. This project has also been supported by a residency with Lower Manhattan Cultural Council in space generously donated by Savanna. I spent lunchtime in Roslyn, Long Island today. There is a "Duck Pond" and a really old clock tower in Roslyn. It was too hot to be outside, but my Japanese-style parasol was a cool item to have today. A man who was crossing the street mentioned to me, "it's a good idea to have that now." when I joined the Independence Day Parade last year. I visited Japanese grocery store in Roslyn (Shin Nippon Do) on the way home. Larry and I are celebrating the holiday by joining the bagel lunch served at the club house of our condominium. 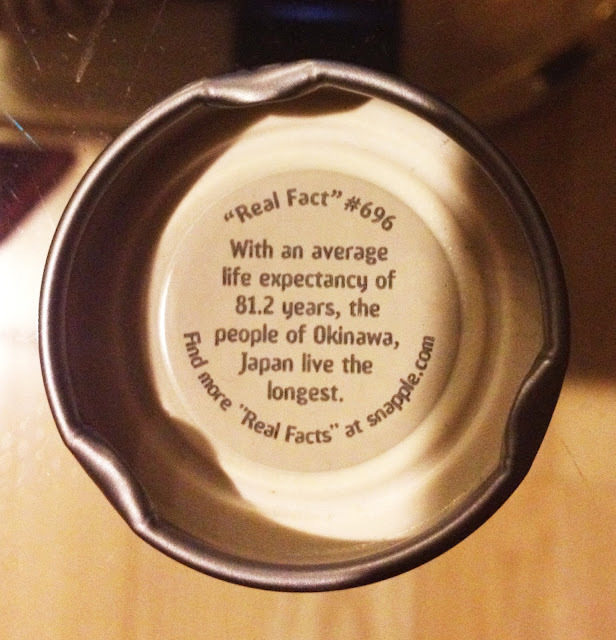 I got a photo of a Snapple's cap from friend today. The information below is my new video; Chinnuku Jyushi song. Larry and I attended an engagement reception yesterday night. A son of Larry's best friend has just engaged. This is flower I have got from my friend, Rie, at the recital on June 23. The flowers look good even today, one week later. Thank you Rie san for beautiful flowers.